The Gran Hotel Bahia del Duque is located next to the beautiful beach of El Duque in the coastal town of Adeje in Tenerife. Its architecture is inspired by Canarian houses of the 19th Century with the harmony of its colours. The Hotel is surrounded by subtropical gardens whose doors open out to fresh patios and picturesque squares inviting guests to relax. Accommodation at Gran Hotel Bahia del Duque features luxurious Double Rooms with a choice of Garden or Sea View as well as Casa Ducales Rooms which provides a “Club” service to guests. Suites and Villas all include private terrace, garden and swimming pool. Guests can enjoy finest cuisine and refreshment at the Hotels 9 restaurants and 9 bars. 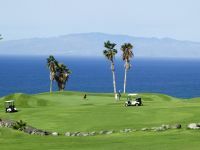 Golfers can enjoy two great Championship Courses Costa Adeje and Las Americas that are within easy access of the Hotel, or simply unwind at the luxurious World-Class three-level ESPA Spa. The Hotel is 15km from the South Tenerife Airport Reina Sofia, with transfers available with your package through Ascot Golf. Ascot Golf packages at Gran Hotel Bahia del Duque are based on Half Board meal plans. 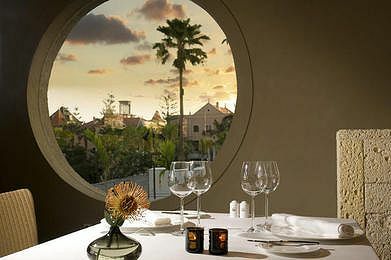 Resort Dine-Around offers Evening Dinner at the following restaurants: El Bernegal (Buffet), Las Aguas (Canarian Gastronomy), La Brasserie (French), La Trattoria (Italian), La Tasca (Traditional Spanish), Asian Kan (Japanese, Chinese & Thai), La Hacienda (Latin Cuisine), Beach Club (Seafood) & Moet Gastro Tapas. Listed Package Prices: Listed Golf Package prices apply with Half Board included. Ascot Golf Packages at Gran Hotel Bahia Del Duque are based on Half Board Dine-Around with Deluxe Garden View Room accommodation. The Casas Ducales is an exclusive area of the Hotel which recreate a colonial estate. In the Reception area, which is always attended by a select staff you can enjoy a splendid variety of aperitifs. The Casas Ducales rooms and suites are situated in a privileged and exclusive area of the hotel with the option for Sea Views. Renovated by the interior designer Pascua Ortega, its furnishings have been exclusively designed for the Casas Ducales with an exquisite combination of fine materials, which achieve an atmosphere of luxury and balance. Its guests receive personalized treatment, as well as butler service and special attentions in the rooms. - Breakfast terrace and lounge. - Casas Ducales Club room with Courtesy bar and free WiFi connection for guests. - Private solarium with drinks (soft drinks, water, juice). - Mid-morning cava (Sparkling Spanish Wine) in the solarium. - Sheet and Pillow Menu. - National and International newspapers in the room. - Greater flexibility in check-in and check-out times. Booking Terms: Supplement price per person in addition to listed package prices for 7 night stays. Starting prices available in Low Season with rates to be confirmed on request for your preferred travel dates and length of stay. 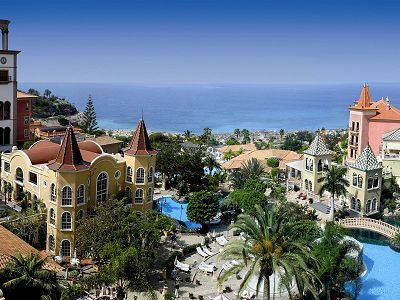 Listed Package Prices: Listed package prices apply on a Half Board basis with optional supplement for Casa Ducales room upgrade for a luxury "Semi-All-Inclusive" visit to Tenerife. The Gran Hotel Bahia del Duque offers 480 luxury rooms, situated within in 20 low-rise buildings reflecting Canarian architecture at the end of the 19th century. Double Rooms Deluxe Garden View and Premium Sea View Rooms are located in separate environments throughout the leafy resort. Each room is decorated with a style for privacy and refined luxury, and to avail of the natural light and the sea breezes. Amenities include Television with LCD display with Satellite and a Selection of Films, Bureau, Mini Bar, Safe box and Air Conditioning. Casa Ducales Double Rooms Decorated by the prestigious designer Pascua Ortega, the Ducal Residences offer the following exclusive services: separate entrance and reception area, business centre, private lounge, butler service to tend to your clothes and personal objects, cushion and sheet selection list, national and international press in room, reserved parking, private solarium, courtesy bar with snack and drinks, special gifts in the room. The Ducales guestrooms combine personalised service of traditional hotels with state of the art technology, sophisticated amenities in rooms and a modern decoration with canopy beds. These rooms offer garden or sea views. Bathrooms offer separate bath and shower facilities. Junior Suite These spacious rooms can be equipped with twin or king beds and have a fully equipped Bathroom including separate shower and bath. All have a balcony or a terrace, with magnificent views over the Atlantic Ocean or the lush subtropical gardens of the hotel. Suite All suites have been carefully designed to provide harmony and space which is perfect accommodation for a family or friends with the greatest comfort. All suites have a balcony or a terrace, with magnificent views over the Atlantic Ocean and the lush subtropical gardens of the hotel. One or two rooms with independent bathroom and sitting room. Family Suite Features 2-bedrooms, two independent bathrooms with shower and bath, and a separate living room with TV. Some of the suites include a Jacuzzi in the garden. 40 separate villas designed by the prestigious interior decorator Pascua Ortega were opened in January 2008. Each of them has a private garden and pool as well as Bang & Olufsen music equipment in addition to separate reception area and butler service. The villas open out onto a splendid pool and to a speciality restaurant Las Aguas run by a canarian chef Braulio Simancas, who offers creative cuisine based on local, seasonal products. There are three different types of villas (Las Palmeras, Las Retamas (duplex) and Las Mimosas, the latter with two bedrooms). Villa Las Retamas includes one bedroom one bathroom with separate shower and toilet, bathtub with natural skylight and elements of basalt stone with modern décor. Separate spacious living room-dining room plus kitchenette. All this is laid out on two floors, with its own terrace, garden and swimming pool. Maximum capacity 2 pax. Villa Las Palmeras includes one bedroom + one bathroom separate shower and toilet, ample bathtub with natural skylight and elements of basalt stone with modern décor), spacious living room-dining room, kitchenette. All this is laid out on a single floor, with its own garden and swimming pool. Acqua di Parma cosmetics in the bathrooms. Maximum capacity 3 pax. Villa Las Mimosas includes two bedrooms two bathrooms with separate shower and toilet, bathtub with natural skylight and elements of basalt stone with modern décor. Separate spacious living room-dining room plus kitchenette. All this is laid out on a single floor, with its own terrace, garden and swimming pool. Maximum capacity 5 pax. The Bahía del Duque Resort offers a fantastic variety of choice of bar/dining, with 9 thematic restaurants and 9 bars providing a unique and extensive culinary experience to guests. Las Aguas: Restaurant situated in the Villas complex, run by Braulio Simancas. Creative cuisine based on local and seasonal products [See Fine Dining]. La Brasserie: French cuisine in an environment full of charm and colour. Open from 10am until midnight. La Trattoria: the Italian touch of the hotel, a warm and funny environment. Open for dinner. Asian Kan: With a menu that fusions Japanese, chinese and Thai cuisines, the new Asia-Kan Restaurant completes the extraordinary gastronomical offer of the Bahia del Duque. La Hacienda: A different gastronomic proposal with the colourful Latin environment. A gastronomic tour can be made through the cuisine of three continents. Restaurant located on the promenade. Beach Club: All the sea flavour, a place to taste seafood, rice, fresh fish and the best dishes of Mediterranean cuisine. All with beautiful sea views and beside the main swimming pool. El Bernegal: Diversity of Buffets. Restaurant and Terrace with show cooking and daily breakfast service. Moet Gastro Tapas: Surrounded by a luscious garden area with Balinese beds and sofas, the Moët Gastro Tapas reinterprets the concept of the summer terrace, creating a chill-out atmosphere which mixes both fun and relaxation. the Piano Bar: Enjoy drinks and cocktails with live music and shows. Bar Azul: Perfect for a lunch time drink and snack. El Chiringuito: Situated directly on the beach perfect for a drink whilst enjoying the ocean view. Rincón del Café: For exquisite coffee or tea accompanied by classic bakery and sandwiches. 800 metres of golden sandy beach with direct access from the hotel, 5 swimming pools: 3 with fresh water and 2 with salt water (2 heated ones), 2 for children, Spa, Shopping Gallery and Mall, Internet Cafe and Astronomical Observatory. The resort is also surrounded by 5 of the best golf courses on the island all located within 20 minutes drive. Reading lounge with both national and international journals, Bridge and Billiards Lounge, 2 Tennis Courts, 2 Squash Courts, Putting Green, Jogging Circuit, Botanical Promenade, Beach Volleyball, Croquet, Gymnasium, Tai-Chi, Aqua Gym, Aerobics, Dance Classes. Beach sports include hang gliding, jet ski, parascending, water sports: diving, windsurfing, sailing, water ski, deep sea sport fishing. Mini Club for children between 3-12 years. Every week a different day-long program is offered, with different kinds of activities in the morning like: painting, handcrafting, star-gazing from the observatory, treasury hunt, or excursions through the botanical promenade which usually end at the kids' playground. At noon, more activities are organised in the Mini-Disco and in the kid’s pool. In the afternoon, the children can enjoy a magic show, with clowns, etc. in front of El Bernegal Restaurant. Teen Club is a new area for the young guests at Bahia del Duque, inspired by the atmosphere of the movie “Big Wednesday” and lifestyle of the surfers on the coasts of California. This new area is equipped with a chill out zone with TV and a selection of movies, various board games, Internet, WII, Play Station and a Table Football room. The town area of Costa Ajece is situated near to Los Americas, and Los Cristianos on the south west of Tenerife. Generally considered to be the upmarket and quieter area, with excellent dining, designer shopping, and quiet cafes and cream stalls overlooking the tranquil El Duque beach. Also a very enjoyable boardwalk for walks and jogging. 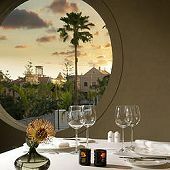 Gran Hotel Bahia del Duque is home to a range of excellent restaurants, including Las Aguas run by Canarian Chef Braulio Simancas who offers guests the best products of the island, through a creative cuisine based on recipes from the traditional Canarian gastronomy. Located in the Villas area of Gran Hotel Bahia del Duque, Las Aguas was designed by prestigious interior decorator Pascal Ortega. The restaurant offers a unique and exclusive atmosphere, with an excellent selection of fine international wines. Among others Braulio Simancas has been awarded the Regional Prize of Gastronomy, Prize Plate Day for the Canary Islands and Premier of the Academy of Gastronomy of Santa Cruz de Tenerife. The Spa at Bahia del Duque has been created by award winning British Spa leaders, ESPA. Bahia del Duque Spa has 32 treatment rooms, 5 of which are outdoor cabins and 2 are private suites, one single and one double measuring 70 m2 each with a terrace, relaxation area, showers and baths for individually-tailored treatment in complete privacy. Over a surface of 3500 m2, the Spa offers an outdoor thalassotherapy circuit unique in the Canary Islands, a variety of jets, water massage beds, swan necks and bubbles that relax muscles and help to release tension with sea water rich in mineral salts and revitalising properties. Furthermore, the facilities include a hammam, saunas, Scottish showers, kinesis fitness area, solarium and cold water pool. The Garden Café Restaurant at the Spa offers a varied, innovative menu with light and creative dishes using healthy, natural ingredients, accompanied by a wide selection of teas and natural fruit juices. The building has been designed and built using ecological criteria, with natural, local materials, such as basalt and tuscan stone, making sure that it is south-facing to enhance natural light and create flexible, harmonious areas integrated with its magnificent gardens – making for a heavenly retreat exclusive to Spa guests. For further details on the ESPA Spa at Gran Hotel Bahia del Duque, please ask your Ascot Golf sales agent, or, to ensure availability at the spa for your visit to Gran Hotel Bahia del Duque, please include your spa preferences with your Ascot Golf Holiday booking. Costa Adeje hosted the European Tours Tenerife Open in 2003. The course has typical local features of black volcanic sand and is noted for the excellent condition of its fairways and greens. Wonderfully located, overlooking the south coast, and Mount Teide to the north. Accommodation in Deluxe Garden View Room, Breakfast, Daily Evening Dinner, Green Fees as Listed, Local Taxes.